From the guys (aka Burger King) that brought you Subserviant Chicken comes The Sith Sense. 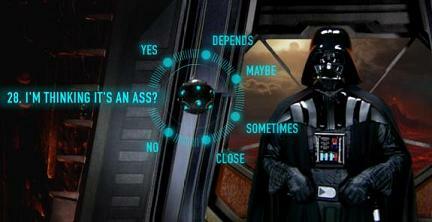 Awsome… Darth Vader reads your mind with 20 questions. Spamusement – Poorly-drawn cartoons inspired by actual spam subject lines! If you are looking for some funny articles by college students, check out this website. It is made partially by some of my buddies at UofM. I thought this was kinda funny, but maybe only if you are a programmer. Me: you don’t call people back? After you’ve seen Star Wars Episode Three you should see this parody of it. And while you are there, check out the other short films. I liked the “A Glitch in the Matrix”.